In a large pot, combine the drained chick peas, lamb, chicken, onions, lentils, turmeric, cumin, cinnamon, paprika, concentrated stock, and 12 cups of water. Add salt and pepper. Bring to a boil and simmer gently for about 1.5 hours. Remove lid and add the rice, cilantro, parsley, celery, tomatoes and cook for another 20 minutes. Mix the tablespoon of flour with a half cup of water until smooth. (I usually put both in a jar with a lid and shake.) Then add this to the soup, stirring gently. Let cook for an additional five minute. Serve in bowls with the lemon cut in wedges and served on the side. I've made this recipe with and without meat, and it is delicious both ways. The meat adds a nice extra dimension, but if you are vegetarian you should definitely try it using vegetable stock and without the meat. I really like the way this soup thickens with the lentils and the added flour at the end. 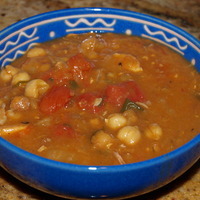 It's like a thick split pea soup, with a wonderful flavor explosion from the added spices! Loved this recipe. Will make again. Glad you enjoyed it Myra! Thanks for reviewing. I absolutely love harira. And there are so many versions of it. This is the recipe that I made recently: http://inthekitchenwitheva-eva.blogspot.com/2011/10/harira-for-me-nothing-is-more.html I used beef the last time I made it. Amazing with either lamb or beef!